From Mugello you can plan some wonderful weekends as many places are within an hour and a half's distance from Siena using public transport or some travel agency from Siena. Here a list of suggested place to be seen in Tuscany. Firenze, capital of the region of Tuscany, has a population of around half a million inhabitants, spreads on the banks of the Arno, between the Adriatic and the Tyrrhenian seas, almost in the middle of the Italian peninsula. It is a city which bustles with industry and craft, commerce and culture, art and science. Being on the main national railway lines, it is easily accessible from most important places both in Italy and abroad. Learn more about the city of Florence, about its history and its cultural life and past with AboutFlorence.com, your tourist guide to Florence. 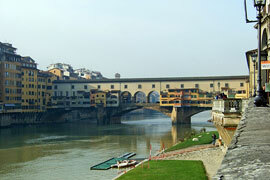 Here you'll really find all kind of touristic information about the city of Florence. Find also usefull services as city sitghtseeing and guided visits, museums reservations, airport transfer and much more. 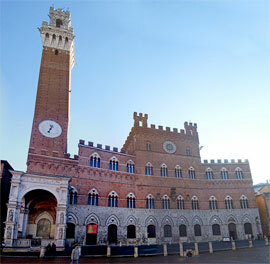 Siena once rivaled Florence for artistic and political dominance in central Italy. Walking the winding streets of this remarkable hill town, you can enjoy the artistic fruits of this rivalry. The Piazza del Campo is a beautiful square in the heart of the city, where each year rival neighborhoods complete in the "Palio", the horserace around its perimeter. Visit the adjacent Palazzo Pubblico or town hall where you can enjoy frescoes by Simone Martini and Lorenzetti before ascending the bell Tower del Mangia for a panoramic view of the city and countryside. From there it's a short walk to the big green and white striped Duomo, with its paintings by Pinturicchio, sculptures by Bernini, and the famous "Pergamo", or raised altar, sculpted by Nicola Pisano. Do not forget a visit to Museo dell'Opera Metropolitana which houses one of the most beautiful proto Renaissance panel paintings. Also see Duccio's multi-paneled altarpiece, the Maestà, which is actually located in the abandoned walls of what was to have been one of Italy's largest cathedrals. At some point during the day make sure you drink some coffee and taste the Panforte, one of the Siena's most typical pastries and a great delicacy. Learn more about the city of Siena, about its history and its cultural life and past with AboutSiena.com, your tourist guide to Siena. Lucca, is a small city still surrounded by its original defensive walls; one of Europe's finest and most beautiful circuits of defensive walls came to being as Lucca lies near the sea and is protected on three sides by mountains, hence allowing access to Italy's second largest agricultural plain to be controlled. In the center of town an ancient Roman racetrack has evolved into the main market square, right next to the cathedral and a visit to the Palazzo Ducale, where Maria Luisa of Borbone and Elisa Bonaparte lived (rumors say that Napoleon slept here too) is well worth it. 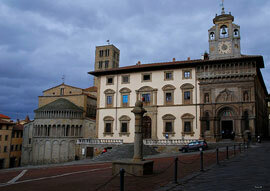 In Arezzo you will see traces of different civilizations and traditions: the Etruscans, the roman and the medieval. Petrarca, Piero della Francesca, Luca Signorelli, Giorgio Vasari were all born here. In Arezzo you can see Piero della Francesca's famous fresco cycle depicting the Legend of the Cross. These are the frescoes that Juliette Binoche gets to look at while dangling from a rope in the movie "The English Patient." A visit to this part of the region allows you to discover, besides the artistic, architecture and religious beauty, the little medieval villages located in this area. If you hire a car you can follow the wine route: for about 200 km through various wine growing areas: Chianti DOCG, Chianti Colli Aretini DOCG, Colli Etruria Centrale DOC, Valdichiana DOC and Cortona DOC as well as Vin Santo. 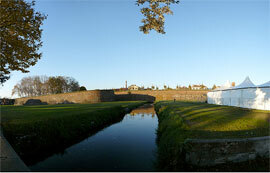 You will see vineyards, olive groves, tobacco plantations, chestnut trees and for. During the Roman époque Pisa was a prosperous sea- town, however, the barbaric invasion left the city in ruins and only when the citadel became a free town did it acquire, with the passing of time, more political and economical independence. The XI and XII centuries were a time of splendor; in this period, the city had primary importance inside the Italian peninsula and the Mediterranean Sea thanks to its maritime business and the conquering of Sardinia, Corsica, and several Balearic Isles. 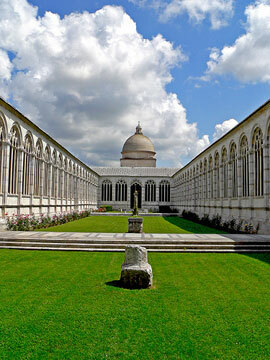 In the major tourist attraction in Pisa is of course the leaning Tower along with the Baptistery and the Camposanto, all of them built between the XI and the XII century.